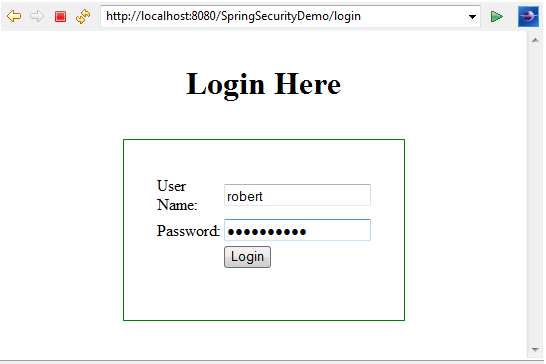 In our previous discussions we go through 'What is Spring Security' and 'Custom login form in Spring Security', previously we have used XML based username and password to authenticate a user. In this particular blog we will see how to use username, password and role details from database to authenticate a user. At the end of the blog we will see how to perform authorization with spring security based on different roles. Let us start our discussion with project structure, please go through the pom.xml file to get information regarding dependencies needed in spring-security. 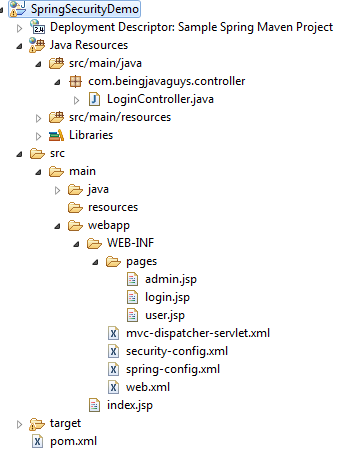 Setup a Simple Maven project and import it in Eclipse, and follow the step by step instructions mentioned below. As per spring security documentation, we need to create two suggested tables 'users' and 'user_roles' in database with exact datatypes and columns. Here is the script to create tables in DB. users-by-username-query="select username,password, enabled from users where username=?" This is a simple Controller class with few request mappings in it, we have '/login' to redirect the user to login form along with custom messages if required. Another mapping id for admin page '/admin' and '/user' only logged in users with required 'USER_ROLES' will be able to see the pages. This is another simple jsp file, this will be rendered to the browser if the user with 'ROLE_ADMIN' is logged in successfully. We have also added a logout link in the page, logout functionality to work onw has to make the spring specific link '/j_spring_security_logout'. By clicking the link spring-security will logged out the current logged in used. This is another simple jsp file, this will be rendered to the browser if the user with 'ROLE_USER' role is logged in successfully. We have also added a logout link in the page, logout functionality to work onw has to make the spring specific link '/j_spring_security_logout'. By clicking the link spring-security will logged out the current logged in used. Here we are done with all required configurations, if everything goes right you will see below mentioned screens in your browser. Authentication means who can enter in the system based on their login credentials, whereas authorization tells the system that what are the authenticated users those can access a particular system functionality. 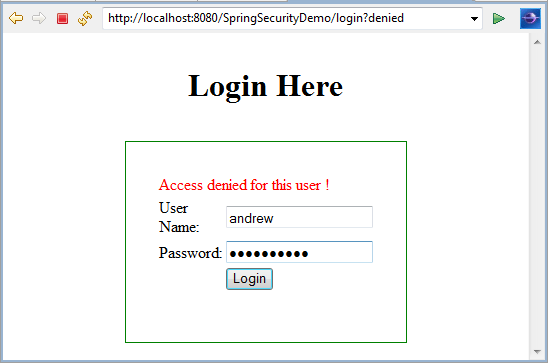 Trying to aceess '/admin' page, hit url "http://localhost:8080/SpringSecurityDemo/admin"
Spring security will redirect it to login page, because according to the interceptor configuration only a logged in user can view this page and that too having user role as 'ROLE_ADMIN'. Lets try to login with 'robert' we know that 'robert' does not have 'USER_ADMIN' role, so there will be a '403' access denied error, this is what we called 'Authorization in Spring security'. Although 'robert' has valid login-password but cant view the url's whose role it does not have. Now let us try to login again with 'andrew' credential, 'andrew' has required role i.e. 'ROLE_ADMIN' to view '/admin' page so this will be a successful login and will be redirected to admin page. We know that both users have 'ROLE_USER', if you try to access 'http://localhost:8080/SpringSecurityDemo/user' then it will be success login and you will see user page. This is all about ' Spring Security Authentication and Authorization Example with Database Credentials'. In upcoming blogs we will see more about Spring, Hibernate, Java and Other opensource technologies.